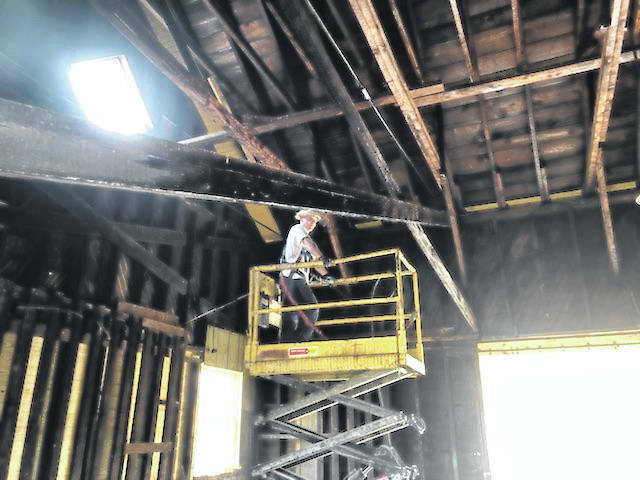 Workers inspect the rafters of the Gallipolis Railroad Freight Station Museum during cleaning to remove bird excrement. 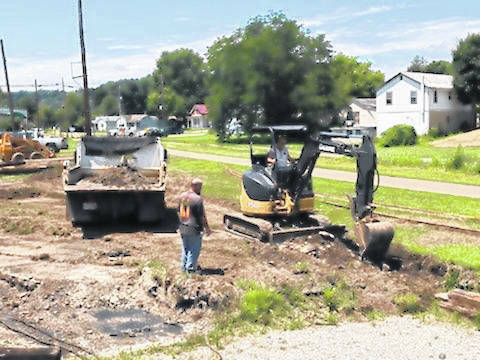 Excavation is done outside the Gallipolis Railroad Freight Station Museum in preparation to lay more rail and for the anticipated addition of a passenger car and locomotive. GALLIPOLIS — The Gallipolis Railroad Freight Station Museum is moving forward with plans to make use of around $125,000 it anticipates to receive as part of the passage of the Ohio General Assembly’s capital budget bill. The bill awarded the monetary amount to the museum and various amounts to other entities across southern Ohio in May. According to the museum’s board of trustees Vice-President Jerry Davis, the process and organization of interior improvements is starting. The warm season of 2017 was spent replacing the museum’s roof as well as placing authentic rail track outside the museum, complete with a caboose. So far this summer, MPW Services has assisted in washing the interior of the old freight station building to rid it of bird excrement. Davis Brothers Construction helped prepare ground for the laying of more track as the museum also plans to add a new passenger car and locomotive engine in the near future. Davis noted the board was grateful for the engineer’s assistance as well as to all others who had supported the museum’s efforts. Once the plans have been finalized and approved, the museum can receive more accurate estimates of what work and cost will be needed to continue the more than 100 years-old building’s rehabilitation on Third Avenue.